Love the Gumnut Babies? May Gibbs Inspired Kids Room Ideas! When styling the perfect kids room for your little Gumnut Baby, look no further for inspiration than May Gibbs and her beautifully imagined Australian bush wonderland. With a fabulous range of homewares, toys, artwork and clothing featuring the iconic images of beloved May Gibbs characters like the gumnut babies, your little bush fairy’s bedroom is sure to send them sweetly off to the sandman come bedtime. Read on to find out more about how you can create the perfect kids room inspired by the magic of May Gibbs. They say a masterpiece is nothing without the proper canvas, and this is a truth known universally to interior decorators as well. To create the ultimate May Gibbs paradise for your little one, you need to start with the beautiful colours of the Australian bush. To accentuate the idea of Australian flora, use white walls with perhaps an olive, light green, or even yellow feature wall. Neutral colours for the furniture, such as white or light-coloured wood, help reflect the colours of native gum and wattle trees and add to the overall atmosphere. Little things like this will go a long way in helping to create a charming gumnut babies themed oasis for your child. 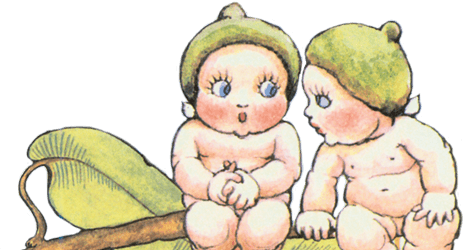 May Gibbs’ charming and iconic illustrations have enchanted Australian children for generations, and so it’s only natural that her artwork would be a key feature for any gumnut baby-themed bedroom. Choose from beautiful vintage black and white wall hangings or colourful illustrated prints to add a sense of flair and charm to your child’s room. May Gibbs décor is everywhere lately – from items like bed linen and pillows to bunting and rugs, there’s something to suit every bedroom. 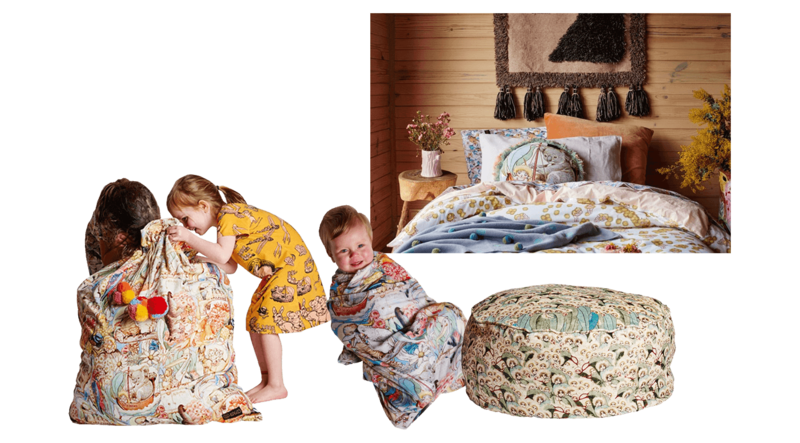 Kip and Co have released gorgeous May Gibbs bedspreads and blankets, complete with beautifully illustrated Gumnut and Bush babies floating through gum leaves, wattle, and a host of stunning Australian flora. These stunning children’s cups and plate sets can be displayed on a shelf and toys featuring the adorable gumnut babies are a practical way to continue the theme. Add iconic Australian animal prints or soft toys such as koalas, kangaroos or whatever animal your child favours, and your May Gibbs-themed bedroom will have a more personal touch. May Gibbs’ wonderful books are truly works of art and no May Gibbs-themed room would be complete without them displayed prominently. Choose from literally dozens of books inspired by the Australian landscape and add style and personality to your child’s new bedroom. These books will even double as beloved reading material that your child might one day pass on to their own children. Check out some of the beautiful editions available in our own shop. For a gorgeous May Gibbs-themed bedroom that is tailor-made to inspire sweet dreams, check out the May Gibbs store!